8-23-08 - Today Katie is "10". Boy how time flies. Again, we went to Uncle Hugh and Aunt Cari's house with the family. We released balloons with notes written on them. We sang "Happy Birthday" and ate cake. Katie provided us with another beautiful day of sunshine to celebrate her birthday. We hope you enjoyed your balloons and shared them with Pop-Pop, since he is with you now. We love and miss you every second of every day. 8-23-06 Today is Katie's birthday. She is 8 years old. Katie has provided us with a beautiful, sunny day to celebrate her birthday. As a tradition, we release balloons with notes written on them. We watch them rise to the heavens, delivering our messages to her. I'm sure she receives and reads every one of them. Then she shares the balloons with Kelly and all her friends in heaven. Enjoy them sweetheart. We love and miss you very, very much. 9-10-05 It has been 2 years since our Katie gave her hand to the angles and let them take her to heaven. We can only imagine how Heaven has changed in these 2 short years with Katie's influence, personality, charm and her ever present laugh! We continue to miss her every minute of every day and know that she looks over all of us to make sure we are OK! !Katie now has a friend to help her with all of her "Heavenly" chores. Kelly Ann Beahan met with Katie on August 10, 2005 to see how this whole heaven thing works. Kelly showed up unexpededly but Katie was there to meet her at the door and introduce her to everyone. 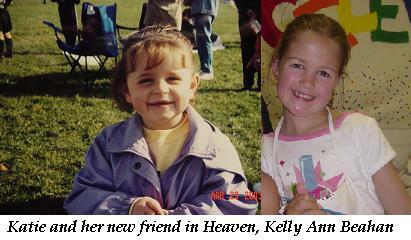 Katie and Kelly are now the "pair" to know and hang out with in heaven - like any of us ever doubted that!! 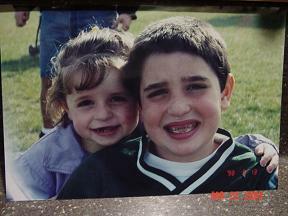 All of us now have 2 (very influential) angels to look over us and make sure we are OK. Yes, believe it or not I do have my own Home Page. I created this site to keep all of my Family and Friends updated on my most recent challenge (no, not letting Dad think he is funny but that tiny golf ball that came back in my shoulder). Please click the "Updates from Katie" to read updates about my progess. You can also visit the "My Photos Page" to see some cool pictures and if you click on "Sign My Guestbook", you can even leave me a message (I read every one). Me hugging my big brother Paul - I love him! !